The Inuit are the aboriginal inhabitants of the North American Arctic, from Bering Strait to East Greenland, a distance of over 6000 kilometers. As well as Arctic Canada, Inuit also live in northern Alaska and Greenland, and have close relatives in Russia. They are united by a common cultural heritage and a common language. Until recently, outsiders called the Inuit "Eskimo." 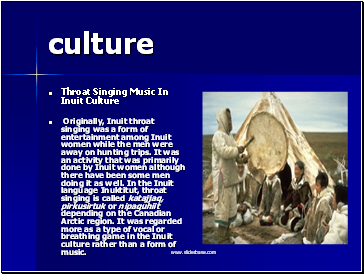 Now they prefer their own term, "Inuit," meaning simply "people." 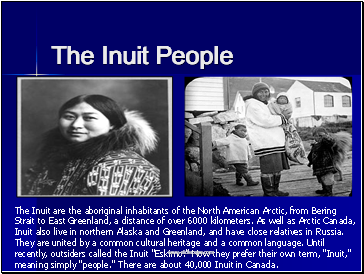 There are about 40,000 Inuit in Canada. According to archaeological research, the origins of the Inuit lie in northwestern Alaska. These first Alaskan Inuit lived on the seacoast and tundra, where they hunted seals, walrus, whales, and caribou. 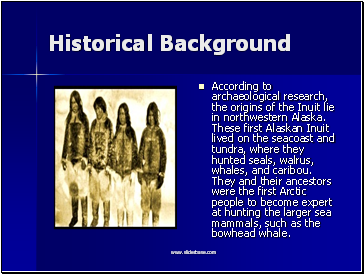 They and their ancestors were the first Arctic people to become expert at hunting the larger sea mammals, such as the bowhead whale. First Nations and Inuit, families, and communities find themselves with decreased levels of self-sufficiency. For instance, as a result of their upbringing in residential shools, generations of First Nations and Inuit have been unable to develop traditional knowledge and skills, including basic parenting skills. 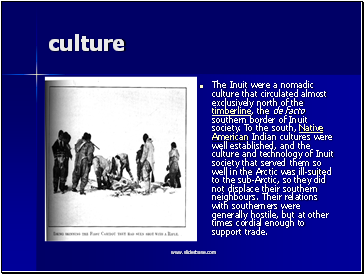 The Inuit were a nomadic culture that circulated almost exclusively north of the timberline, the de facto southern border of Inuit society. To the south, Native American Indian cultures were well established, and the culture and technology of Inuit society that served them so well in the Arctic was ill-suited to the sub-Arctic, so they did not displace their southern neighbours. Their relations with southerners were generally hostile, but at other times cordial enough to support trade. 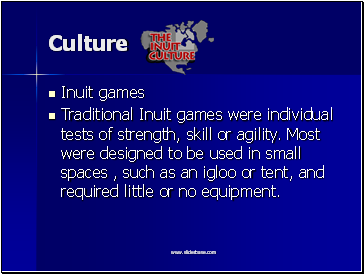 Traditional Inuit games were individual tests of strength, skill or agility. Most were designed to be used in small spaces , such as an igloo or tent, and required little or no equipment.